Who is StockMaster Access Equipment ? StockMaster products are manufactured by Custom Ladder Company based in the regional centre of Queanbeyan, New South Wales, Australia. The founders of Custom Ladder Company began operation as a wholesale business supplying the building and construction industries. This included supply of special purpose ladders which lead to a breakthrough design for a mobile platform ladder. The need to improve safe operation of ladder products has a long history. The earliest known use of ladders dates back to the Mesolithic period some 10,000 years ago. The ladder in the Mesolithic rock painting on this page is at least 10,000 years old and shows two humans using a ladder to reach a wild honeybee nest to harvest honey. The paintings are from the Spider Caves in Valencia, Spain. 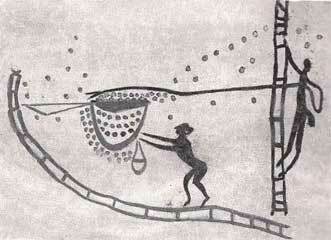 The second painting also shows humans gathering honey using ladders and a long reaching pole. 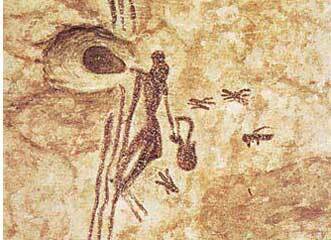 This painting was discovered in Pachmarhi in Central India and dates back to the Neolithic period. A significant step forward was made in 1862 when John H Balsley filed a patent for the first folding step ladder. 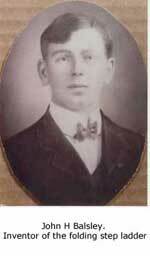 John Balsley was born in 1823 and earned his living as a carpenter in Dayton Ohio. Although the step ladder had been around for several years before 1862 Balsley was the first man to patent the idea. The name “step ladder” came from the fact that the ladder had flat steps for the user to stand on in place of large round rungs. Also Balsley’s ladder had a hinge at the top of the back brace so that it could be folded. 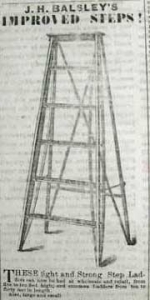 The advertisement for Balsley’s ladder is a good example of 19th century advertising. 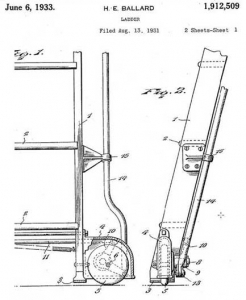 International patents for safe mobile ladder designs show that solutions for improvement have been sought as far back as the early 1900’s however an opportunity there remained to improve the product particularly with respect to safe operation. In 1994, Custom Ladder Company (CLC) commenced experiments with a series of design possibilities to produce a safe productive and cost effective mobile platform-ladder. This resulted in the first release of the Stockmaster range of technically innovative access equipment in 1995. Today CLC products are available across Australia and New-Zealand through an extensive distributor network and are also exported to Asia and Europe. 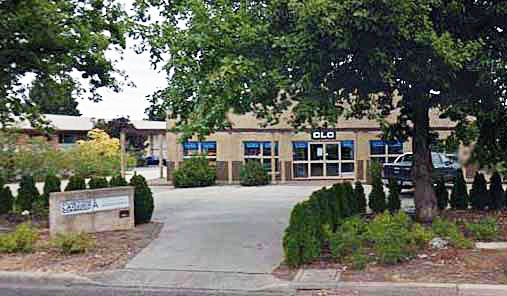 CLC products provide safe, easy to use, and productive access solutions for Retailing, Manufacturing, Transport, Records Management, Warehousing, Storage and many other applications. We offer professional quality access equipment with full factory back up service and technical advice. Our pricing reflects the quality philosophy of our products. To put simply it is to be expected that a quality product will cost more than a cheaply made alternative. However when it comes to purchasing the price is only what you pay; the quality is what you get and experience shows the quality of an access product is paramount in ensuring the safety, ease of use and long term satisfaction of the customer.